Just because you say your customers are “members,” that doesn’t create a member relationship. In fact, throwing around the “member” word when you are otherwise treating them like customers can make your customer retention worse. This program shows you how to transcend a customer relationship to foster a stronger, longer-lasting member relationship. You’ll learn the differences, and how to build systems that’ll enable you to create these relationships at scale. Ken McCarthy, the sponsor of the first conference on the Web’s commercial potential in 1994 interviewed for me for his System Club members. Ken has been a pioneer of internet marketing for decades, now he’s largely retired. Ken and I delve into the powers that make members join and renew on the internet. Ken is a great interviewer, he’s been at it for a few decades. Get out a pen and some paper for notes. I’ll turn you over to Ken McCarthy. Listen by clicking above, or download MP3 here. Ken: Hi, this is Ken McCarthy and welcome to the System Club. This is our Master Class this month. And what’s the Master Class about? Well, Master Class is going out and finding people that are doing remarkable things in business and marketing, not just in internet marketing, though pretty much everybody’s involved in the internet now these days, but this is a case of a guest who has a broader vision than just the internet and it’s something that applies directly to anybody that’s doing anything on the internet or any continuity of course on the internet. For sure. His name is Rob Skrob. 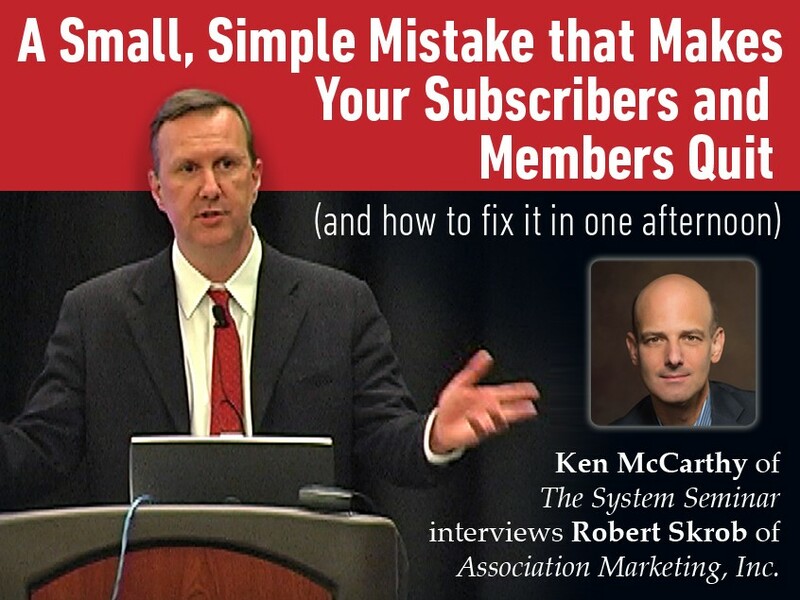 Among other things he’s the publisher of The Skrob Report, which I am a subscriber to, and we’re going to talk about his work why it’s so important and what you can learn from him to pretty much instantly increase the value of your business and the size of your monthly revenue. Robert: I’m proud to be here. I’ve been a follower of yours what 15-18 years now and it’s an honor to be able to give back to the community. Thank you. Ken: Oh, well thanks for saying so. And I love getting The Skrob Report because it makes me focus on one of the most important issues in business which is once you’ve got customers or members or clients or whatever it is that you call them what do you do next? And that what you do next is really 80 percent of the game and unfortunately we’re all guilty, me included, of not giving that aspect of our business it’s due. And Rob has made the focus of his business thinking about this subject, all the ramifications, all the variations, all the permutations of it, and reminding us all through The Skrob Report and other vehicles not only on how important it is but giving us different ways of thinking about it and different ways of taking action to make sure that we’re getting the most from the customers that we have very laboriously and very expensively acquire. So Rob what was it that led you to decide hey, you know what? This is what I’m going to focus on as an advisor? Robert: I’ve been in the association industry, the non-profit world for more than 20 years, and really stumbled onto Dan Kennedy and this whole world of magnetic marketing back in 1996. And so I learned copywriting from Dan’s book on how to write a sales letter writing a sales letter for an association to recruit membership. And I got a $7,500 bonus from a client for some marketing and then I used that to buy a copy of all of Dan Kennedy’s courses at the time. This was back in 1999 I believe or 2000. And that was really the beginning of my education and I figured out this whole world of information marketers and started a business with Dan Kennedy and Bill Glazer and really learned that side of it. But what I’ve been frustrated with is that this world of information marketing and internet marketing has never really figured out the membership concept other than labeling their customers as members. And it’s very typical of the association world to have an average retention of your members from one year to the next at about 85 percent. Now with the clients that I work with in the association world if my association clients got 85 percent I would be fired within weeks because generally I’m in the 95-99 percent realm with my association clients. But what I found in this online or information marketing or this membership world is that they’re not keeping 85 percent of their members from one year to the next they’re lucky to keep 15 percent. And very small changes to their retention can make huge differences in their income and in their lifestyle and really just the overall security of their business because it becomes a lot more stable and they don’t have this constant flow of customers running through their business. I call them grab and dashers that jump into membership, grab all they can and then dash back out as fast as they came in. And instead you have a business where you’re building relationships and really building a lifestyle that is a lot more fun to operate under. Ken: Yeah, I mean just to look at this at the most simple level and then we’ll get into some of the techniques that you use and some of the mindset relating, mindset is a big part of what you’re sharing with people, but the reality is there is not an infinite number of customers in the world for what you sell probably. And so the idea that you can endlessly just churn, you know that’ a phrase that’s been used for decades, just churn through customers and not retain them is kind of a form of madness. You’re going to eventually run out. And also it’s quite expensive to acquire a customer in the first place and it’s quite lucrative to keep them for as long as you possibly can. So this is kind of the thing we talk about all the time but we can never talk about it enough and it’s great to have somebody that just focuses on this and this exclusively with us today. Robert: It’s funny Ken, if you don’t mind one of my early mentors in the association industry actually sat me down very early in my career and said, hey look, you know, the universe of our potential members is limited and if we systematically tic them off by not offering great service or not able to help them when they call or not building a relationship with them it won’t be very long that we won’t have any members to serve. And really beat it into me that each relationship is a golden opportunity that we have got to do everything we can to maximize. Ken: Absolutely. And it’s really clear, let’s say somebody’s got an association of candy manufacturers, and I’m just pulling that out of thin air, you know there’s only — there’s a finite number of them and there’s not new ones pouring into the field every year, so if you know what your finite number is and you know how many you have, you know how precious they are. So I think running association, the classic sort of traditional industry association helps people focus on the reality and I’m afraid on the more retail consumer side it’s sometimes easy to get kind of fuzzy headed about how many actual prospects and potential customers you have. It’s never infinite no matter how big your scope is there’s always a finite number. So the real profits in business and the real stability and you pointed out enjoyment really of your business comes from retaining. It doesn’t come — I mean obviously you have to bring new people in, you have to have a lead generation campaign and so on, but for so many people especially in the internet space it seems to end there, you know, we’ll get them in, we’ll get a couple of months out of them and then we’ll get the next flock. And oh, that’s got to be exhausting. So what’s the big — if we could talk about mistakes and if we were to focus on the one single biggest mistake that you see businesses make in this particular area what would you say that it is? Robert: You know, most people always look at when their members drop out and try to dangle something in front of them in order to keep them. One of my early clients with the member retention side was a company called Automotive Training Institute that works with auto repair shops, you know, folks that repair your car, replace your tires, your brakes, or what have you. And in their program, their coaching program we looked at where their average retention, you know, how long they kept a customer on average and that’s a pretty easy number to figure out. You know when they joined and then you record when they drop and you measure the number of days between those two dates and then you come up with an average for all the customers that you have. And kind of what we started the project was is they wanted to take that average and try to do something for them right before that average point in order to try to keep them. And really how you save the relationship but how long the relationship lasts has everything to do with how the relationship begins. And what we did was focused on the onboarding process, how we greeted the member and welcomed them in with new member welcome kits and helping them understand the expectations that they had in the coaching program, the expectations we needed them to do in order to get results and how the process worked. And very quickly we were able to increase their average length of a member by 3-1/2 months. And what that did to the company was add $1.4 million in revenue. But more important than the 1.4 which is there really anything more important? But the business became, well there’s still problems and there’s still things to work out, it became a lot more fun to run because they now had more people coming to their annual super conference. They now had more success stories to report because people were more engaged. And the business was a whole lot more successful and it all started with how they on boarded their members and welcomed them. So many times we really focus on okay, how many automatic one click up sales can we do and how many clicks can we get them to run through this gantlet of up sales and there’s nothing wrong with that. I think that is fabulous to do. We’ve got to maximize transaction size. But then when all the dust settles and they go to bed at night, you go to bed at night, what do you do the next day in order to build a relationship? That’s where your retention starts. Ken: Gotcha. So it’s such a simple thing really. It’s just an investment of thought and then you figure out okay, how are we going to execute? We’ve got the idea to do this now and how are we going to do it. But really it’s the biggest plus is just to stop, take a breath and think, you know, how are we greeting people once they’ve given us that first check? Are we just sending them an invoice or are we sending them a welcome package that acknowledges that we’ve started this new thing together. And amazing that you could add just by that one touch, you could add an extra three months of retention. The thing that you mentioned about conference I want to point out to anybody if they’ve not run a conference this will probably be obvious to anybody that has is there’s an economy of scale and there’s a cost of sort of managerial cost of putting the thing together and getting the speakers and renting the big room and all that stuff, and the more the attendees the merrier. I mean the cost of management is pretty much fixed and pretty much the cost of the hotel is pretty much fixed and they can always make a bigger room for a few more bucks, but the profits that accrue when you add an extra 20 or 50 or 100 or 500 people it’s almost all profit at that point. You know, you need a certain number of attendees just to pay the bills, and once you’ve done that it feels, at least the way when we ran our business it always felt like pure gravy to us, so you might be going from an annual conference that’s sort of a struggle financially to one that’s really massively lucrative just simply by improving the relationship you have with your members. It’s funny that the company that you worked with first said what do we offer them when they want to leave. It’s almost like a courting method where you say okay, well my wife’s about to walk out the door and serve me divorce papers what do I do then? You know, it’s like well how about these hundred other steps that you could have taken potentially to head that off? It’s just a very funny mindset to think in terms of okay, once we’ve blown it or once the relationship’s gone south how do we restore it when it’s so much easier to create a positive relationship. I guess it’s the way we think. So that’s such a great tip and I hope everybody is thinking a lot about that. You spend so much in energy and time and so on to get somebody to send you that first payment and to make that first commitment why not invest something significant in wowing them and making them feel like, wow I just joined something amazing as opposed to oh, it’s another bill to pay every month. And that’s got to be a big thing to overcome because people are looking at their credit card statements whether they’re a business or whether they’re a lone entrepreneur and they see this monthly charge. It’s I’ll go, what are they getting for it? If they don’t feel they’re getting something great the rational thing for them to do is cancel. Robert: Absolutely. One of the things that I used to train, we have an association management company here that I purchased back in ’99 from my then boss, and one of the things that I used to train my people is I said, you know, go home and go to your checkbook and write a check for the association out of your checkbook. You know what the balance is. I have no idea. You think of what it would take to write this check out of your own checkbook and feel that expense. and I thought it was funny that you mentioned about if your spouse is ready to divorce you. I’ve been married for 22 years now and so I haven’t been dating in a very, very long time, but more than 22 years in fact, and so it may be different than it was then, but back in the day when you started a relationship there was a first date and if there was to be a second date or any kind of ongoing relationship you had to call her the next day or the day after in order to kind of reconnect. Maybe they’re texting now or what have you but there has to be some sort of post-date communication and that probably ought to be thought out as to trying to make it as effective as possible. And so many times as a new customer they buy, we send them what they got and it’s like slam, bam thank you ma’am and it’s kind of like a what I say is they really have a series of one night stands instead of building a relationship with their customer. And really having a system to be able to do it at scale where it isn’t so manually focused. And my goodness we have some of the best CRMs that have ever been around in history and we’re using them to convert customers but we’re not using them to convert relationships. Ken: The software that helps you turn a prospect into a lead is the same software that can help you turn a customer into a follower, into a devoted enthusiastic follower. I love that image you gave of somebody — again, it’s a simple concept but we don’t really look at it and we really should of it not appearing as an expense but as a gateway to this wonderful thing they’re getting. There are products and services that I resent having to buy, you know, I probably don’t like paying my utility bill every month, you know, but I got to pay it. But then there are other services that I get that oh my God I wouldn’t want to be denied the privilege of giving them money, you know so that I can get the goods. So at a very basic level the customer, the member has to feel that they’re getting a great deal whether they’re paying $95 a month or $950 a month or more or $9 a month, whatever the amount is, they have to feel that it’s actually a deal that they’re coming out as the winner, you know, they’re getting things that they no other way could they put together on their own if they tried to put it together themselves. Robert: No question. And I think one of the real keys is, like what you mentioned is, the real difference between products like utilities I mean my goodness you could think of that in a completely different way because the utility powers your entire life. It provides you hot water and the power that you use to run your computers. I mean it’s a really amazing gift, but yet your feelings about it are not as romanticized as I’ve just made it. So the difference between something you love to invest in and something you resent is really just a personal feeling. It’s a perception. Once we recognize that the perception of what they’re investing in completely controls their behavior well now we’ve got to learn to study the whole process of controlling the perception. It wasn’t that long ago, for some reason I keep bringing up association examples, but I’ve been working with for profit memberships for more than ten years, but back in the day when I was just learning copywriting in 2000 I had an association I was marketing that it’s one single benefit that it delivered they gave you nothing. There was no return on your investment for joining this association. The only thing you got was a custom renewal invoice 12 months after you joined. That was all you would ever receive. And what it helped me understand is that folks buy things and they join and they’re members of things for a lot of different reasons other than the return on investment. Really one of the big breakthroughs that I was able to do with the association world was when I brought return on investment to it. When I first joined Dan Kennedy’s coaching group back in 2003, you know, I showed him some examples and results and things and he suggested that I should share it with everybody else but the real key, the reason why I started getting great results was the ROI, the association world has figured out that there are a lot of other reasons why people join and they stay engaged and become a member that are well beyond ROI. And that’s really one of the key ways that you can grow your membership is rather than being on this treadmill of providing content and thinking oh my goodness if I want to double my membership then instead of delivering a 12-page newsletter I need to deliver a 24-page newsletter. Well, value is just like water. Too much is just as bad as too little. And if you try to overwhelm the or wow them by delivering more you’re going to chase them off by delivering too much. Ken: Well, you know that also has an analogy in the dating world. You know? It’s not a good thing what do they say? Come on too strong. It’s good to be polite. It’s good to be interesting. It’s good to be interested, but you know, if you’re gifting the pursuit of your affections with lavish gifts early on you know that makes people go wait a minute this is a little too much. So that’s another use of that analogy. So if people are looking for things beyond a clear cut dollar and cents return on investment what are some of those things that people look for when they join a community or an association or just get involved with an ongoing service? Robert: With the for profit world, you know, whether it’s software as a service, or you’re delivering a subscription we can go over quite a few different examples of folks that have incorporated these things into their businesses that it may sound oh well, that’s not the type of business I’m in, but if you are in the business of trying to lead people then this is the business you’re in otherwise you’re just in the one night stand business. So one of the key things is a chance to be part of something bigger than themselves. And when you use an Apple product, well when I first went to Apple and started working on my Mac Book I thought, oh my goodness I’ve really got to step up what I’m writing because I need to make sure that whatever I write is worthy of this device. I mean it just worked so well. And the thing, it was like I was part of this culture of artists and magical people who were using this type of equipment and now I got to use the same thing they were. When Infusion Soft sells their CRM, yeah, here’s a tool that’s going to allow you to do some neat things in your business but even more than that they are an advocate for small business success and they position themselves as this advocate helping small businesses grow and oh by the way we offer this tool that can help you in your small business. And whatever you’re doing if you provide and present a mission for what you’re after that’s bigger than just exchanging something for money you’re going to attract customers to you that want to be part of your mission in addition to receiving your products and services and the connection between an android user and an Apple user is huge. They don’t have anywhere near the same emotional connection to their device and it’s because Apple works hard at giving you the feeling that you’re part of a special group and you are better than others because you use this type of product. Ken: Gotcha. And they’ve been able to leverage that into charging four times as much as their hardware as anybody else. And I’m reminded of, I have kind of an interesting perspective on this because a friend of mine was the PR advisor to Steve Jobs when Steve Jobs took Apple back. In fact, I was sitting having dinner with him when the text came in and it was a text from Steve Jobs that said, “Call me,” and he showed it to me on his text. I hope he photographed it because that was certainly a historic moment. And Apple had that amazing mystique that they originally created when they first started and then they brought in the Pepsi guy. I don’t know what his plan was, but he didn’t really accomplish much except almost run the company into the ground. He was more of I guess a commodity sort of guy. And then Jobs came back and managed to reignite that passion basically for the box. And I remember one of the things he did which I thought was nuts at the time, but I now think it had a stroke of brilliance to it, along the Hudson River there’s this sort of a pier area down in Lower Manhattan and he had huge posters, billboards of Gandhi and Miles Davis and I don’t know, just any, Einstein, and it said, “Think different.” I think that was their motto way back when. And I thought this is just silly. But I realize no, what he was doing was he was associating creativity and progress and ingenuity and broad thinking with the Apple product so that you’re right, it’s you join this magic society, you don’t just get a machine, you know, you’re part of this society. Now Einstein never used an Apple computer. I’m pretty sure Gandhi didn’t either. So it was very clever of him. And all of those people what did they represent? They represent something bigger than us. Very, very interesting. Very interesting. So how do I do that — yeah, sorry go ahead. Ken: You know what? I love that. As an advocate of internet marketing I have to confess I’ve seen the problem but the solution never occurred to me and you just gave me maybe my years’ worth of great ideas in one second there. Because yeah, there are people bringing services and information and experiences that would be otherwise unavailable by any other source. You know, I’ll give you an example, I don’t mean to take us off track, but a couple of years ago I started putting up videos (inaudible 00:31:06), videos of jazz musicians, class jazz musicians on a website and it’s all from You Tube and I organize it and make it really easy, I index, all searchable and so on, and I got up 40,000 plus subscribers, you know, years later. And this is something that, and people love it, the people that love it they love it, like with a capital L in 50 point type, in all exclamation point bold, you know, I mean they’re mad for it, and this is something that would have been physically impossible. There would have been no way to deliver a full archive of these videos to people by any other means had the internet not come along, had I not applied some internet marketing chops to this issue. And it is a positive. It’s a total positive, you know? It’s positive for the fans. It’s positive for the musicians. It’s positive for the kids who try to learn the music. I mean it’s just an amazing, amazing thing. And we don’t have that in our industry. We don’t have somebody going around and chronicling the wonderful things that some internet marketers are doing. Ken: People like Rush Limbaugh, you know, those that like that they can’t get enough of it. Robert: And so those businesses are built, and yeah they do a lot of good and they help and bring a lot of issues to light and in no way demeaning any of those, but for a lot of their listeners a very large percentage they’re going to hear — they’re showing up to hear what they already believe. And by you proclaiming the value of internet marketing and what they’re doing and helping them see the value of their contribution to the economy they love it and they want more and that is as valuable as showing them the next new trick for internet — and in fact, it may be more so because chances are they already have plenty of tricks. They just need to feel better about themselves and if you help them feel good for an hour then you have greatly contributed to their self-worth, self-esteem, and their day and their lives and that was a lot easier than coming up with the next new trick. Ken: Yep. You know, there’s a book that our member Gary Pennsylvania recommends, he thinks it’s one of the greatest books on salesmanship and copy and he even says copywriting even though it’s not a copywriting book which is Frank Becker’s, How I Raised Myself from a Failure to Success through Selling, and really I totally recommend that book to everybody. It is not a trivial book at all. It’s quite, quite profound. And I like the fact that Gary thinks so highly of it that should be enough for everybody to read it, but I want to also add my voice to it. And it’s not really a technique. It’s not a book of techniques. It’s a book of mindset. And one of the things that he talks about in the book is when making sales calls Becker was an insurance salesman, he would get to know, and he sold their businessmen, he would get to know the business, he’d be aware of the business, he would be aware of their challenges, he’d be aware of their triumphs, and when they had a triumph and he made a call on them he was aware of the triumph and he brought it up. And he said that that, and it makes perfect sense you know, he said that made a huge difference on the relationship he had with the people that he called on. He also would encourage young businesses, you know, they were struggling, but he dropped by, hey how you doing? How’s it going? You know, and showed real interest in their venture and what they were trying to accomplish, and this created a great bond because you know insurance is insurance and how on earth do you distinguish yourself from any other 10,000 people selling insurance. And yeah, of course, if you know where that person lives so to speak psychologically and you can talk to them about things of interest to them that uplifts them, first of all its business people, wow, I mean we’re all under the gun all the time, we have too much to do with too few resources and we’re never making the money that we really want to make. I mean it’s just, you know, it’s always that, and nobody cares. So when somebody shows up who cares who gets it, A, and cares, that’s like a big deal. So this is very, very powerful what you’re talking about. Let me switch gears on this and ask you a question. Let’s say I don’t have a membership, anything that can be interpreted as a membership. Let’s say I am an auto repair shop, you know, and people just come in and they get their car fixed and they go. Is there anything of what you do that — and that defines a lot of businesses, restaurants, you know, dry cleaners, I mean there’s just a million and one businesses like that, is there anything that you do or approach that you take that could help a company, a business like that? Ken: That exists by the way. There are many bars and restaurants around the US that are outposts, that are cultural outposts of New Orleans. There’s even some that organize annual trips to the city because it’s such a unique cultural place, and people that love New Orleans love New Orleans, if they’re in, there’s one in like Pennsylvania like it’s a bar and grill and it literally is like a little piece of New Orleans stuck in southeast western Pennsylvania. I don’t know if you knew that, but this is a real phenomenon that you’re describing. Robert: And it could be also, like the auto repair, it could be all about safety and so you start your commercials and your messaging with your customers, you know, the last thing I want is for your daughter to get stuck on the side of the road in her car, so let me tell you about the three things that you need to look for as you begin this summer. Well, nobody wants to look for anything. The first thing they’re going to do when they hear that commercial is drive their car to that auto repair shop to have it looked at to make darned sure their daughter isn’t stuck on the side of the road with the car. Robert: And so it isn’t about I want to work on your car. It’s about I want to make sure that your vehicle is safe for you and your family. And it’s not about serving food, it’s about the New Orleans lifestyle, or it’s about the healthy lifestyle, or it’s about an hour you can go someplace and forget about your problems and just relax and have a nice time. Ken: Yeah. No one will confuse the New Orleans lifestyle with a healthy lifestyle. But I get your point. Robert: Well, yeah, that was a list. It wasn’t necessarily all the same one. Ken: But it is this idea, you know, here you are living in a suburb of Pittsburgh and Pittsburgh’s a wonderful city, but it’s Pittsburgh, you know, and especially in the winter you know you’re not in Key West, and yet you can get in the car and drive somewhere and kind of be down south and you know the food’s southern and the music’s southern and everybody’s sort of in that mindset that’s a great service to offer people. Robert: Everybody is escaping from their reality or trying to, and if you can be the thing they escape to either because they want to get away from their bills, either by going out for an evening or going to a concert or running to your home equity line of credit if anything like that exists anymore, but what have you, whatever it is that you’re offering, if you’re offering it as an escape then you’re going to succeed and have customers coming to you. And whether you’re offering it as a membership or you are doing your business just as a one off customer without a structured membership you’re going to grow a following by delivering and selling escape. That’s why Jimmy Buffet is huge, the difference between Jimmy Buffet and his guitar playing and Eric Clapton and his guitar, there’s absolutely no comparison. And yet Jimmy Buffet has licensed products, restaurants, thousands of fans, his concerts sell in seconds, and all of it is because he sells an escape, you can put in a song and transport yourself to the beach as you sit in traffic on the interstate. And that’s a thing that he figured out that Eric Clapton has not. Ken: Yeah, I know it makes perfect sense, and probably from a strictly musical point of view Eric Clapton’s probably the superior musician too to top it off. Robert: I would say by — I mean Jimmy Buffet has said, I mean that’s why I feel comfortable saying it is he has said himself that Eric Clapton is a much better guitar player than he’ll ever be. Ken: Yep. So we’ve seen a few things here. One is don’t, if you have a community business or a continuity business or a membership business, step one, don’t make your system be okay, when they’re leaving what do we offer them to keep them to stay. That’s like, you know, don’t do that. On the positive side, when somebody signs up, how can we make that signing up I guess a term now these days is onboarding, how can we make that onboarding experience really remarkable, something that makes them sit up and go wow, I’m really a part of something. Another issue that you raised is this being part of something. How do we make the experience of doing business with us bigger than just simply the transaction of an oil change for $20.00. You know, no I’m actually ensuring the safety of my daughters. Wow. Well, that’s a whole different world than an oil change and yet they are actually equivalent things. And we talked about the power of escape. And I hope everybody caught that. It’s a very profound concept that we really all, whether we’re massively successful or moderately successful or it doesn’t matter who we are we all think there’s some better place than where we are and we’d like to go there. And maybe we know that we can’t go there because we have a family or a business or whatever but we’d sure like an afternoon there or an evening there or a week there or a weekend there. What else can we do if we’ve got — oh, and also to be a spokesman, to be an advocate, to be the positive light amongst your group. For instance, and I think the example internet marketing is just brilliant. We hear, unfortunately, the negative side of internet marketing is often the most prominent thing in people’s minds and that is hard on us frankly. And the idea of reminding, having a steady stream of reminders that say there are people who are doing amazingly positive things with internet marketing, I think that’s a great idea. So what else can we do along these lines? And also you said something really important too. It’s not a matter of volume, it’s not a matter of all right let’s send them a 500 pound box of tapes or DVDs or whatever they mail these days, that is not necessarily the answer, in fact maybe a negative. It may overwhelm them and they may think oh my God, you know, this is too much, I can’t deal with it I’d better go somewhere else. We’re kind of running up on time, so what would be one last one that we should chew on and think about when it comes to our businesses and what we can do to retain our customers longer or if we have a membership our members longer? Ken: I would love that because it is surely a neglected art. Robert: So all right. So Ken, imagine if you would you were too busy to get breakfast because of meetings and travel and what have you, you missed lunch and it’s 3:00 in the afternoon and you’re starving. You got a headache, you can’t really see, you’re just starving, starving hungry, and you find a restaurant, you go in and of course it’s 3:00 so there’s nobody around anywhere. You finally kind of wave down the hostess who’s over off in a corner doing some table work and she comes up to you and finds you a seat and then at your booth you’re greeted by your server. And your server says, oh my you look very hungry today. I tell you what this time of day there are three things that come out of the kitchen the fastest, number one, number two or number three. Would you like to order one of those three things or would you like to see the whole menu? How do you feel? Ken: I love it. I love it. And even if I want to see the whole menu I love that somebody is looking out for me and helping me navigate the maze. I’m amazed. I don’t think I’ve ever had that experience in a restaurant in my life. Robert: So with our members they are joining because they’re hungry. They perceive some deficit in their life that they want to cure, they want to fix and they’re joining your program because they want to fix that. Chances are the reason they feel like they have a void in their life is because your sales message told them they had a void and then increased the pressure on them to the point where they’re going finally I got to buy. So you have created this hunger and this desire and so now they come in, they buy, they’re sitting down and they’re ready to consume and what do they get? Is it a box of 24 DVDs that they have to go through? Is it a member site? I had a client who has this beautiful member site, had way more than a thousand awesome videos. They were funny. They were informative. And he called it the something-something library. And I said, how are libraries valued in our society? That’s where the homeless use the restroom, right? And the library isn’t helping the homeless at all. So our people don’t want libraries. And then also folks, the same person was going, oh well, I send my new members cookies in order to welcome them and thank you, and man I love everybody who sends cookies to my office, but if you walked into that restaurant and the server met you at the table and said, oh darling it’s great to see you. We got some desserts left over from lunch. Here they are. You’d be going, I haven’t eaten all day, so I eat this dessert I’m going to be sick. I don’t want this. I’m hungry. Get me some real food. Well, now after you ate and you had a nice meal if then she brought you some desserts now all of a sudden they’re bonus, you love it. So you created a hunger with your sales message as to the problems they have and how they can solve them. Give them a solution to that problem as quickly as possible. I know we’re running out of time so I’ll give a very, very quick example to help clarify. A client, Michael Rozbruch, who works with CPAs and attorneys who market to people with IRS tax problems. And very often he’s marketing to CPAs as kind of like a biz op helping them get into that niche as an addition to their business. So he tells them all about this niche and how valuable it is and how those clients are going to help them and now they get in and they get this binder and it is probably four inches thick and there is a good eight hours of audio to teach them how to market for those clients, how to convert them when they come into your office, how to build your value and how to sell them and how to charge them and collect that, and then how to control the client because my goodness if they haven’t been able to file a tax return, chances are they’re not really good at like number stuff, so now you’ve just put yourself dealing with these people who aren’t numbers folks, probably have poor records. And then also how to actually negotiate with the IRS. And it’s like this wonderful beautiful system. I said, look, what is the single fastest way somebody can get results with your system? And we worked on this for a little while and then finally it was, well I got this referral letter and if they send out this referral letter then they are going to get clients. Perfect. So now when somebody buys his system, I think it’s a couple of thousand dollars, the CPA, the first thing they see is a video of Michael with the kit. And he goes, welcome to this program. I’m so glad that you’re here. You’re going to receive this entire system. It’s going to walk you through everything you need from marketing to sales to actually getting it done with the IRS, but there’s this one thing that I’m setting right here on top. And this is the referral letter. Before you do anything else get this referral letter into the mail. We walk through the process of who to send it to, how to get it out, where it should go and now his clients are getting customers and clients within days of buying his system and now is his system something they can just let dust accumulate on the shelf? No because they got clients coming in. They got to figure out the sales piece and now they got to figure out the client control and now they got to call and get engaged. So by giving them this one little thing to satisfy that hunger and helping them get started it totally changes the entire client relationship. Ken: Wow. Wow. And I want to point out something you said is it took a while for you working with the client to figure this particular thing to offer. You know, the principle is clear, I mean you knew it he knew it, but coming up with that thing. With Dan Kennedy we call it the widget, you know, what’s the thing that we can put on top of the package that when they receive it it gives them an immediate wow? And it’s so funny, everything that you talk about we talk about in terms of copywriting on the acquisition side, you know, give them some wow in the letter, give them some amazing information in the letter that makes them go, wow, but again, unfortunately the typical thing to do is you got the client and then you just ship them the package and that’s it. So there’s an old saying in sales that a lot of people neglect and maybe don’t understand fully, but I think anybody that’s listening to this call really understands it now and that’s this, the most important sale is the sale after the sale because that’s where you’re going to have client retention and the real profits that having this kind of business has the potential to generate. Rob, this has been a great call. You really lit me up and you’ve given me a lot to think about for 2016, especially loved the — I loved it all, but I especially love this idea that we in the internet marketing world should be doing more to let everybody know about all the good things that are being done with internet marketing. Not just money making, you know, people are making money of course, but kind of all the services we’re rendering, how about all the great experiences we’re making possible that otherwise people couldn’t get. That was a real big one for me, but this whole concept of the sale really begins after the sale and it makes a huge difference not only in your satisfaction with your business but in your financials. Rob, how can people keep up with you if they want to get more information like this? More insights, more inspiration? Robert: I have a report that I pulled together that really outlines everything that we’ve talked about here and actually goes into quite a bit more detail about attraction, recruitment, ascension and retention, and that report is at memberretentionreport.com. That’s memberretentionreport.com and it’s free. You can just download that and check it out because I just go through a real step-by-step, we kind of jumped around a little bit here, but at memberretentionreport.com we go through it as a step-by-step roadmap to building long-term member retention. Ken: Excellent. You know, in the same way that we construct our sales letters and our sales sequences we really should be constructing our membership retention sequences as well. It’s not only every bit as important it probably has an even bigger payoff because as we all know marketing to people that are already doing business with us has a much higher payoff than marketing to total strangers. So memberretention — give it to me one more time? Ken: Memberretentionreport. So if you go to memberretentionreport.com you will get the Member Retention Report from Rob. Rob, thanks again. A great call, a great way to end the year for us here at the System Club. I really appreciate it and looking forward to seeing you in January. Robert: Sounds fabulous. Looking forward as well. Ken: Okay. Take care. Bye-bye.